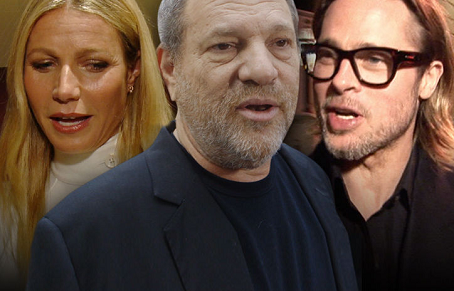 Gwyneth Paltrow says Harvey Weinstein got sexually aggressive with her and her then-boyfriend Brad Pitt confronted the movie mogul. Gwyneth told the New York Times the incident happened in the mid-'90s when she was 22 years old. Weinstein had just cast her in a star-marking role in the movie "Emma." She says she had a meeting scheduled with Weinstein at the Peninsula Beverly Hills Hotel. Paltrow says she was in a hotel suite with Weinstein when he placed his hands on her and suggested they head to the bedroom. Paltrow says she immediately left and said to herself, "I thought you were my Uncle Harvey." She says she confided in Brad Pitt and he approached Weinstein at a movie premiere and told him never to touch her again. Paltrow says Weinstein later called her and screamed at her for a long time and she feared she was going to lose the movie role. So many women have come forward accusing Weinstein of sexual assaults.